Burmese Ponies, also known as Shan Ponies, originated in the Shan state of Eastern Burma, where they are bred today by local tribes. They are similar to Bhutia, Spiti, and Manipuri ponies of the Himalayan Mountains, suggesting these breeds have a similar origin, most likely deriving from the Mongolian horse and other Eastern breeds. 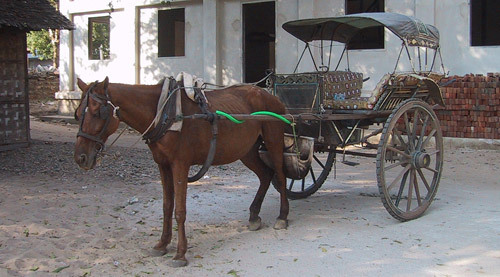 Burmese ponies may reach 13 hands high, and are brown, bay, chestnut, black or gray in color. They are not particularly pretty horses, having been bred for function rather than looks. The head usually has a straight profile, the neck is muscular. The back may be long, and the croup is sloping. The ponies do not have very pronounced withers, and a rather upright shoulder, creating a short stride (which is desirable in mountainous terrain, even if considered a fault in a riding horse). The chest is deep and wide, the hooves small and hard, and the legs are fine, yet strong. They tend to be sickle hocked and the forearms and gaskins are poor. The Burmese Ponies are sure footed, tough, have excellent endurance, are of a quiet temperament, are willing. They are not fast and are not particularly athletic, but they do jump well. They are easy keepers and able to live in harsh environmental conditions. The Burmese is well-adapted to its mountainous environment, being very sure-footed, tough, with great stamina and resistant to the harsh environment. This trait has made them extremely popular as trekking and pack ponies. They have a very quiet temperament and a willing nature, making them popular mounts for novices and children. At one time the Burmese were used as polo mounts for British colonials. However, they are not incredibly fast or athletic, so this was most likely because they were the only mounts available at that time.